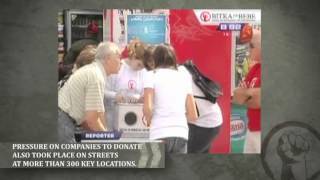 Battle for Babies is Fund B92’s most famous action and one of the most successful humanitarian actions in the region. It was initiated in autumn 2011 after a heartbreaking news report on inadequate conditions in Serbian maternity wards, and with an aim to solve the problem of premature births. So far, through this action 215 incubators were donated to over 50 hospital and medical centers in over 40 cities across Serbia. Over 700 companies, institutions, and organizations and over million individuals have contributed with more than 2.5 million euros. The follow-up of this action has started in 2012 in a form of Battle for Maternity Wards, which focuses on donations of neonatology and gynecology equipment. This action covered over 70 medical centers that were donated equipment worth over 3 million euros to maternity wards, health centers and children’s clinics. So far, we have won 40 battles for medical centers which were provided with all necessary equipment for mother and child care. To reach the final goal, we are left with the challenge to provide donations to 12 more institutions of this type. Inspired by this action, Fund B92 has organized numerous independent actions in partnership with various partners, like reconstruction of a part of Emergency center. Over the years, for Emergency center and other large clinics that are part of Serbian Clinic Center (neurosurgery, pulmonology, endocrinology...) over 600 000 euros were raised for acquisition of most contemporary medical equipment, while 200 000 euros were invested in reconstruction of Emergency center. Battle for Babies and Battle for Maternity wards are recognized nationally and internationally many times, and the most valuable recognition is certainly achieved results and public acknowledgement of the action.